The crockpot is basically my saving grace when I'm way too busy and my days are way too long -- and thus, I'm way too exhausted to cook dinner when I get home. Throw the ingredients in the crockpot in the morning, turn it on, go to work, come home and eat dinner. My work/class schedule is cruel and unusual right now -- as in, totally unnatural and not okay. Two 13 hour days in a row, plus not getting home until 8 or 9 pm three nights out of the week. UGH. I keep reminding myself that it's only 3 months... that soon enough my schedule will change again, and it won't be this bad. One of the hardest parts about having this schedule, though, is needing to plan nearly all of my meals in advance. I pack my lunch every day and also have to pack dinner when I'm gone until 9. 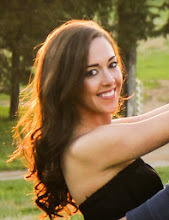 For days when I get home by 7 or 8, I either have something for dinner ready to go (i.e., in the fridge already cooked or in the crockpot), or Ryan will grill burgers or chicken. It takes a lot of planning ahead! This meal is the perfect solution when I want something ready right when I get home. It's a total no-fuss crockpot meal -- no browning the meat first, not too many ingredients. And it's totally delicious! I usually cook up a big pot of brown rice for lunches and dinners on Sundays (or, I just use Trader Joe's frozen brown rice! ), so all I have to do is heat up the rice in the microwave. By the way, I'm assuming I'm not the only one who has a hard time cooking brown rice perfectly -- it often either turns out overcooked and mushy or undercooked and hard. Yuck. But I have discovered the best method for cooking perfect brown rice every time. Check it out if you are slightly rice-challenged as I am. You need 1 - 1.5 lbs beef stew meat (find it already chopped into pieces). This is usually a really inexpensive meat that needs some TLC to get tender -- PERFECT for the crockpot. You'll also need half of a red or white onion, chopped (white is actually better for this, I just only had a red one). Toss into the crockpot. For the sauce, mix together 1 can of low sodium beef broth, 1 cup of red wine (I used a cabernet), and 1/2 tsp each of thyme, garlic powder, salt, and pepper. Pour over the meat and onions. Turn heat to low, and cook for 9-10 (or up to 12) hours. 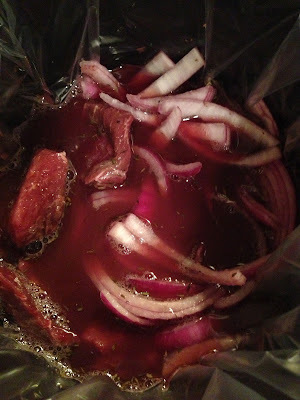 When you're ready to eat, remove the beef and the onions from the crockpot, leaving the liquid in there. A big slotted spoon is good for this. Then, place a mesh strainer over a pot and pour the liquid from the crockpot into the strainer. This captures the "bits" that you may not want to eat. Of course, this step isn't NECESSARY... you could just serve the meat directly from the crockpot and not worry about straining the liquid. I just prefer it to be a little "cleaner." Up to you! Heat the liquid over high heat until it comes to a boil. 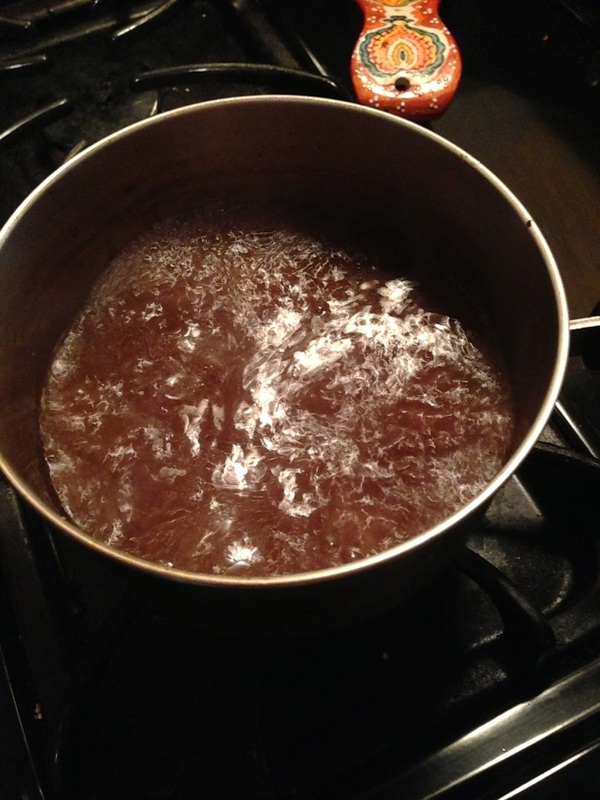 Reduce heat and let simmer until you're ready to eat -- about 5 or 10 minutes. Plate your brown rice. Top with the delicious, tender beef and onions. Mm mm. 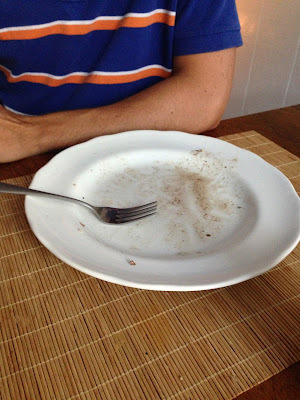 Let's just say, this was Ryan's plate within 5 minutes. He said he could eat this meal every week. Score! 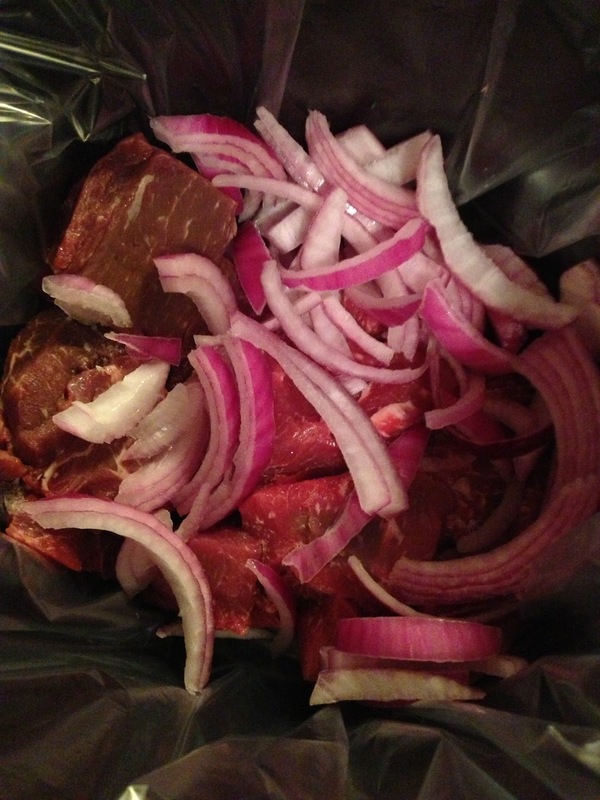 -Place beef and onions in crockpot. -Mix the beef broth, red wine, and spices in a bowl. 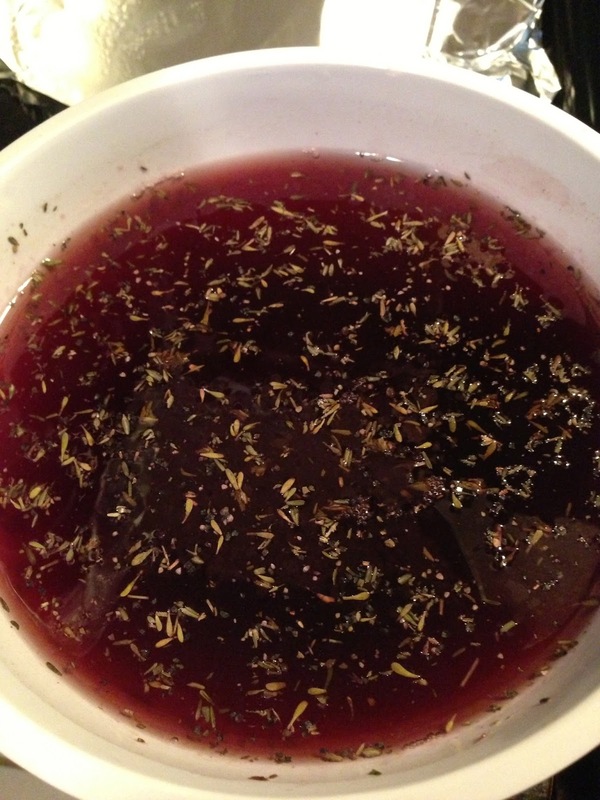 Pour into the crockpot. -Heat over low heat for 9-12 hours. 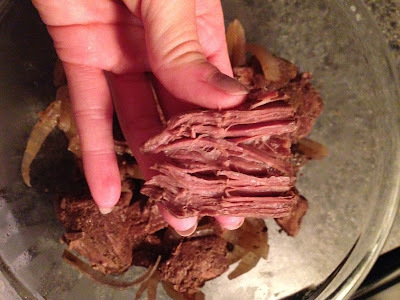 -When ready to eat, remove beef and onions from crockpot with a slotted spoon. Set aside. 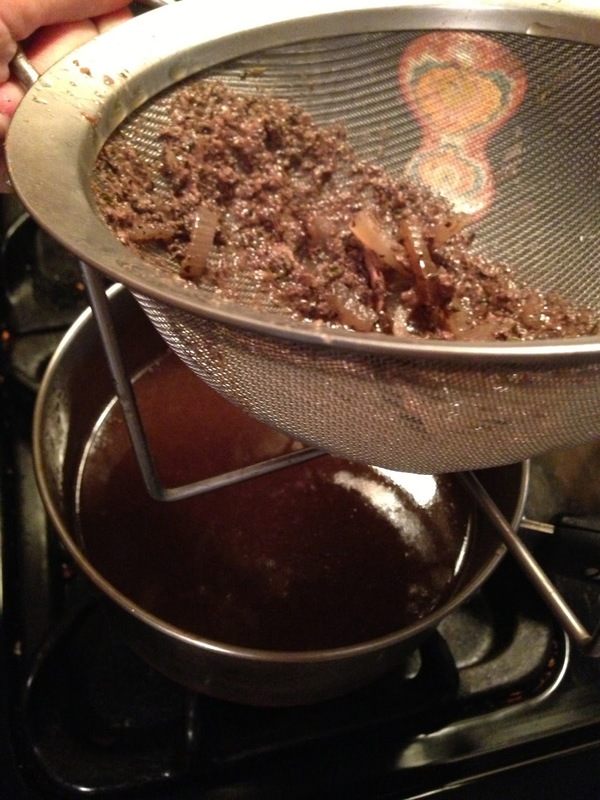 Pour the liquid left in the crockpot into a mesh strainer over a saucepan. 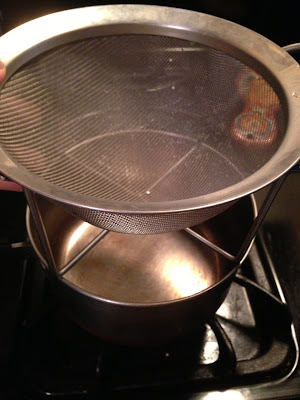 Discard any pieces that the strainer catches. Heat the liquid over high heat until boiling. Reduce heat and simmer for 5-10 minutes. 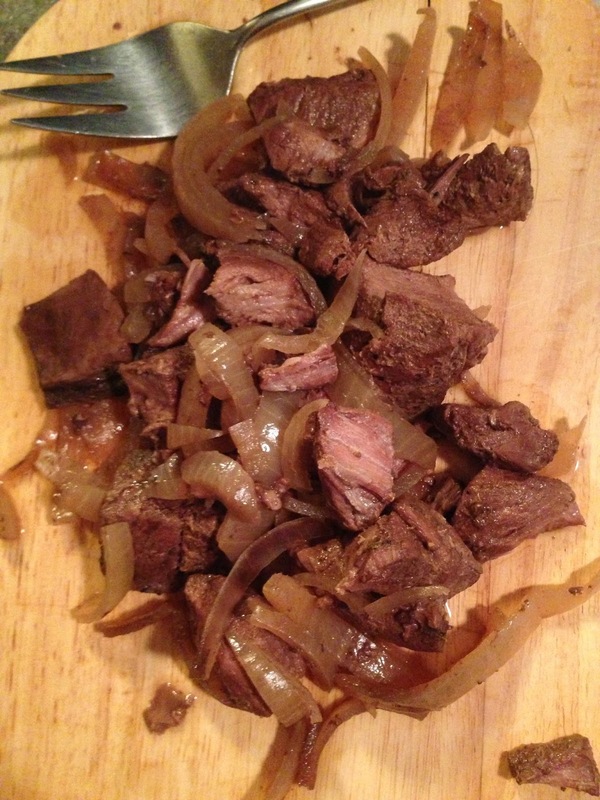 -Serve beef and onions over brown rice. Spoon the heated liquid overtop. WOW! This is really an amazing and attractive post about a wonderful recipe of beef. I appreciate your posted wonderful photos. Thanks for sharing such an interesting post. Add chunks of potatoes, carrots and a can of mushroom soup to make beef stew-- can serve with or without the rice.